The new and improved XStand2 is out - our travel friendly Apple Watch and phone stand is now even more stable, convenient and wider to better fit Plus-model iPhones and QI transmitter. AN EVEN BETTER WAY TO CHARGE YOUR APPLE WATCH AND iPHONE - This new and enhanced version of the XStand comes with a re-designed, much more sturdy padded footing. Sits rock-solid on your table top or nightstand. The flat phone holder provides more space for thicker cases and makes it easier to put-on and take-off your phone. The wider frontplate easily accommodates iPhone 6, iPhone 7 and - Plus models. “WOW - WHAT’S THAT?” Is the reaction our customers get from co-workers. Try and see for yourself. The XStand is attractive enough to be a conversation starter. Made of high-quality metal with a satin finish it looks like a luxury item and far more expensive than it is. A cool looking, upright place to put your phone. Sturdy. Metal. Classy. A COMPACT TABLE ORGANIZER BY DESIGN. Such a breeze to keep yourself updated of all the notifications you are getting. No more picking up your phone after every “ding”. Much easier to keep an eye on your phone while working on projects. Watch videos, use FaceTime. All hands-free. Works with all phones and cases, even small tablets like iPad mini and Kindle Fire. A bedside compliment to your bedroom to keep your night stand tidy, flaunts your watch and phone at a perfect viewing angle. TRAVELS EASY: The dock is foldable, portable and can easily slip into your carry-on bag. Just take it apart, wrap the cables around the 2 metal pieces & stick it in a zip lock bag. Set it back up in your work place or hotel, plug the wires in & instant charging station. Must have accessory for Iphone/Iwatch combo "
I bought this product thinking it would be a temporary solution for my nightstand until I bought something nicer. Upon receiving the stand I was pleasently surprised at how heavy it was. I thought the product was plastic when in fact it is strong metal. Assembles with ease. Perfect fit for my Apple Watch and wireless charging pad. I would highly recommend to anyone. You cannot beat the price for this quality product. Apple Watch & iPhone Stand is Great for Home & Travel "
This combo Apple Watch & iPhone Stand is great. I like having both of them on the same stand and both clearly visible. Everything about this stand is perfect! An additional bonus is that it is compact for traveling & it won't take up much space. It disassembles into a flat piece and fits in my accessory case for cords, plugs, & chargers...I like it so much I'm planning on purchasing two more for my wife & daughter. Just what the nightstand ordered"
Works great. Couldn’t be happier. Bought one for my wife and One for myself. My wife has a charging wedge ( I call it that because of the size and shape) that she bought with iPhone X. Was able to turn the wedge upside down in the stand and phone has plenty of room. Nice job guys. Going to buy several more for Christmas gifts. I know, cheepskate right? Great product for a great price. Charging cables don't exactly add beauty to our desktops. They tend to be in the way when we don't use them and fall off the counter when we do. What if you could keep them tidy and organised in one place? "Puts a smile on your face." Receiving frequent notifications from friends is nice, except when you try to focus on an important task at hand. Having to pick up your phone every time it goes 'ding' adds to the distraction. What if your phone was sitting at a perfect viewing angle so you could read the messages at a glance without touching your phone? Our valued customers are happy with the XStand iphone and apple watch dock (as you can easily tell from over ﻿40﻿0 positive reviews on Amazon). It's a versatile charging station for that flaunts your devices at a convenient viewing angle and keeps your desktop and nightstand tidy. Nevertheless, by listening to our customers we were able to spot the most common problem with the previous version of our iPhone stand: the rubber pads. They tended to come off and go missing. So we went back to the drawing desk and came up with a solution. The re-designed base of the new apple watch and phone stand XStand2 is much more stable and works without additional rubber pads. Want to go wireless charging? You can! 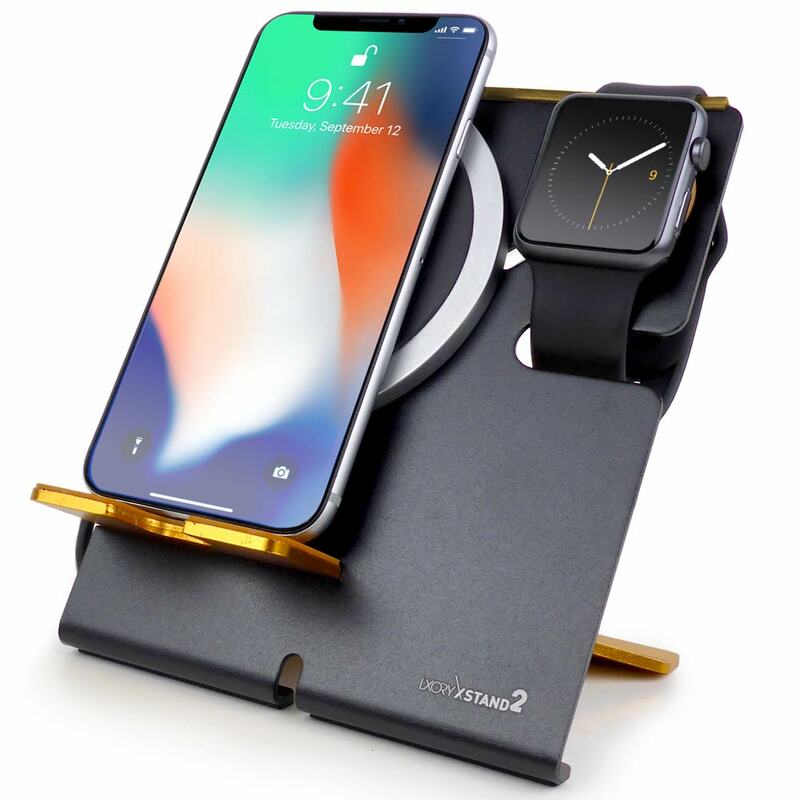 The XStand2 is designed to hold our ﻿﻿﻿wireless charging pad so you can turn it into a wireless apple watch and iPhone charging stand by simply sticking the transmitter pad onto the stand using a sticky patch (included). Learn all you need to know about Wireless Qi charging here. The collapsable 'kickstand' design of the LXORY iphone and watch stand makes it very travel-friendly. Simply disassemble the XStand and it turns into a portable, flat package. Fits into any bag and backpack. That's why frequent travellers choose our mobile travel charging station. Some sellers ship their products in poly bags. We don't. 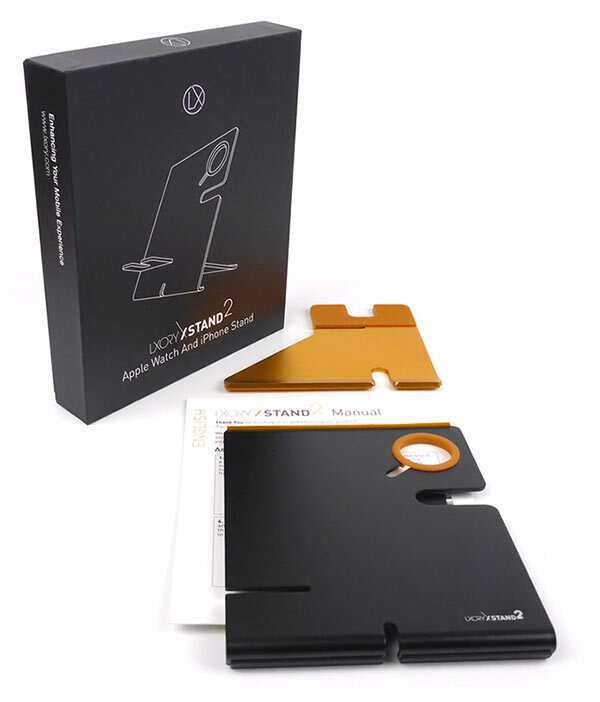 The XStand2 ships in a beautiful, sturdy gift box. Treat yourself or friends and family with this versatile apple watch docking station. Clean up the cable mess on your bedside table, office desk or kitchen counter - where ever you prefer to keep your devices. 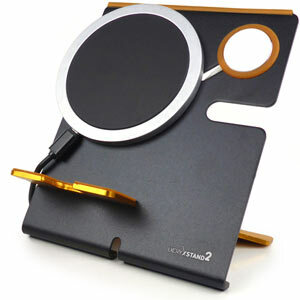 And if you go on a business trip or vacation - the XStand2 won't take much luggage space and can be set up in seconds. The box contains the front plate, foot plate and manual. Just push your apple watch charger head into the round rubber hole, assemble the two aluminum plates and done. The set up process will take you a minute tops. Combine two of our popular products and get yourself a travel friendly wireless charging stand. Go wireless and never touch a charging cable again! For a limited time, we are selling a bundle consisting of a XStand 2 Apple Watch And iPhone Stand and our Qi Wireless Charging Pad for iPhone 8/X and all other qi-ready phones.